Kwon Song Ho (Kwon So’ng-ho) is the Minister of State Construction Control. He is also an alternate (candidate) member of the Workers’ Party of Korea [WPK] Central Committee and a deputy to the Supreme People’s Assembly. Kwon Song Ho was elected a deputy to the 13th Supreme People’s Assembly in March 2014. 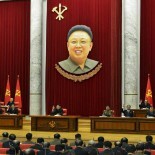 His appointment to the DPRK Cabinet was affirmed during the first session of the 13th SPA that April. During the 7th Party Congress in May 2016, Kwon was elected an alternate (candidate) member of the 7th WPK Central Committee.